Treatment of industrial waste water is one of the most important stages of any production process. Besides, environmental safety is not only a matter of preference, but a requirement in our times. Curiously, increase of sediment dispersion does not slow its setting. On the contrary, sedimentation of solid phase particles in the AVS occurs 1.5 – 2 times faster than in a mechanical mixing device. Converting phosphates into water insoluble compounds occurs in one stage. The duration of treatment is 1-3 seconds. The reagent used is lime with 5-10% excess calcium oxide of the theoretically required amount. 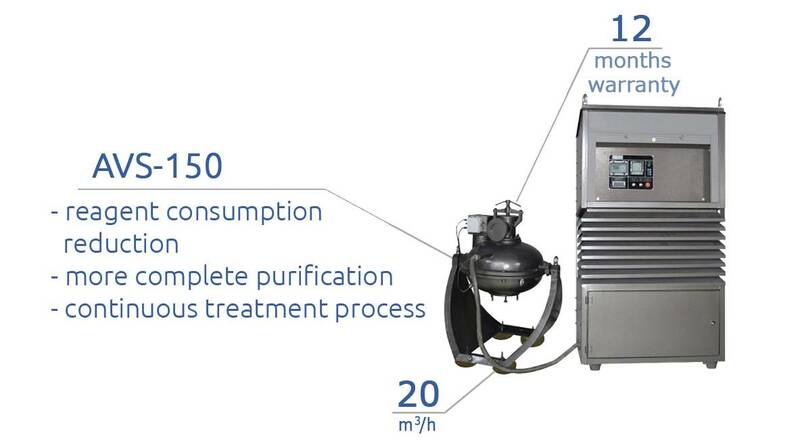 Using the AVS for wastewater contamination allows to reduce the consumption of reagents and power, decreases equipment footprint and improve the quality of decontamination process. Using AVS allows to significantly simplify the process, reduce the oxidation reaction temperature to 20-25º С, lower oxidant consumption to 2-3g per 1 g of phenol and reduce the reaction duration to hundredth of a second. We have developed a new continuous process of decontamination waste water containing phenol and other organic contaminants using the vortex layer device. Implementation of vortex layer device in the process of phenol removal reduced energy costs by 10 – 15 times, lowers reagent consumption by 1.5-2 times, decreases equipment footprint by 1.5 – 2 times. 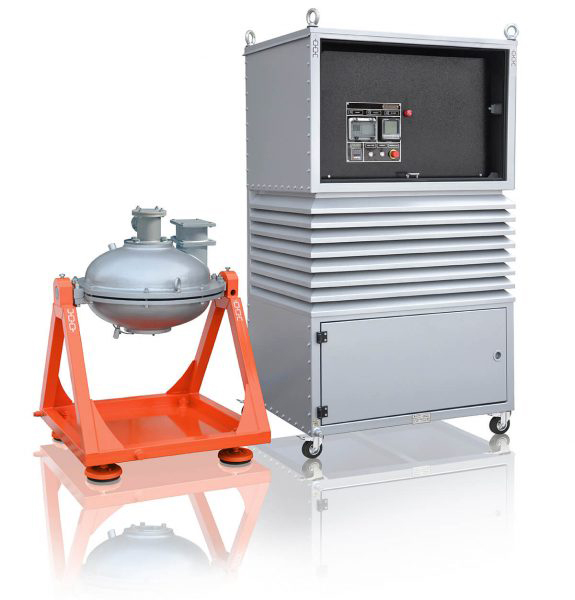 Using the rotating electromagnetic field machine allows to oxidize cyanides and decompose them into carbonates and ammonia in one stage in alkaline environment at pH=9÷10. The reagent used to remove waste water from arsenic was ferrichloride in carious weight ratios to the content of arsenic in the water. The exiting industrial process uses 10 times the amount of FeCl3, only bringing arsenic content to the maximum allowable limits. In the process we used AVS-100 vortex layer device (m = 150 g, τ = 3-5 seconds), and with the consumption of the reagent in the same amount as in the exiting technology, no arsenic was detected in purified water. Using a 5 time excess of the reagent yields the same results, while 3 times excess significantly lowers the concentration from initial 2115 mg/dm3 to residual 116 mg/dm3. Research shows that the use of vortex layer device while removing arsenic from waste water allows to completely precipitate the arsenic after 1-5 seconds of processing in the vortex layer and reduce reagent consumption by 3-5 times compared to the regular technology, simplify the process and make it continuous. Research performed in the area of decontamination and fluor removal from waste water using AVS shows that these devices are more efficient compared to the existing equipment. • After processing of the first sample (2 minutes), the percentage of helminthes dropped by 31%, collibacillus (Endo agar) by 65%, proteus by 70%, anaerobic by 27%, staphylococcus by 80% and complete removal of bacteroides. • After processing of the second sample (5 minutes), the percentage of helminthes dropped by 53%, collibacillus (Endo agar) by 94%, anaerobic by 91%, staphylococcus by 80% and complete removal of bacteroides. The laboratory tested six samples, of which two samples were taken from mice, contaminated by extract of hog and cattle feces without processing of the material in the vortex layer system, our control group, two samples with 2 minute processing time of initial material and two samples with 5 minute processing of initial material. • No helminthes larvae was detected in samples, obtained from initial materials processed for 5 minutes. 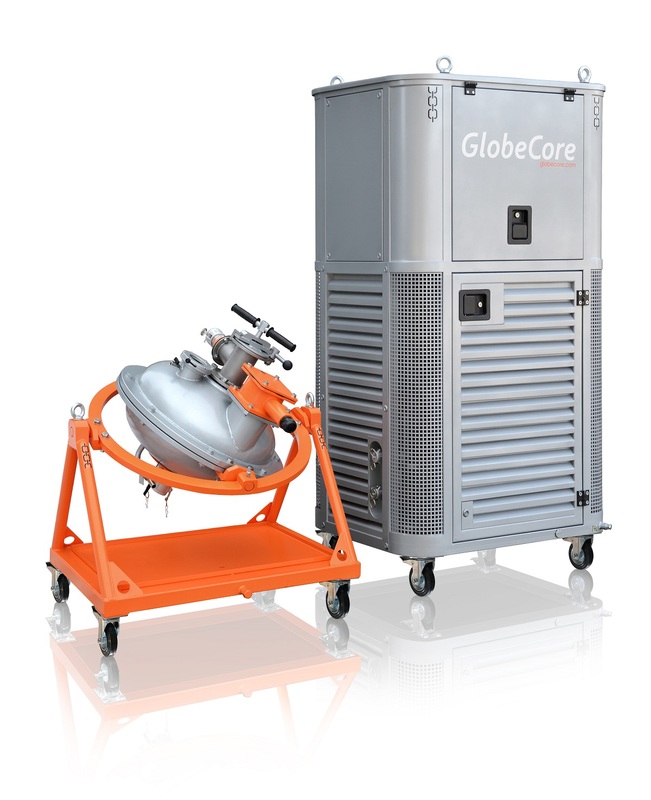 GlobeCore GmbH is one of the world leaders in industrial manufacturing. Products of GlobeCore are used for treatment of wastewater and chemical reactions intensification.